In the prehistory of the world, long before agriculture or the coming of the Romans, a forest didn’t have a name. Why name a forested landscape that wandered everywhere over hill and dale, it would be like naming different parts of the rolling ocean. Clearings were named. You cut down a bit and you give it an identity: Hamish’s clearing, and why not, after all his hard work (and by Charlie it’s hard work clearing trees with a stone axe). In Gaelic the clearings and other identified places in the forest were often named after the animals that were kept there. Bad na muic means ‘Place of the Pigs’, Rin na geroch means ‘Hill of the Sheep’, and so on. Interestingly Bad na ban meant ‘Place of the women’. Who these women were and what they got up to in that place one can only speculate! As the landscape changes over centuries, with forests receding and land more woodless than wooded, the remaining tracts of wood begin to take on names. The most common Gaelic name for forest is coille, a word found variously in Coillhallan in Stirlingshire, or Coilleghille in the Highlands. The equivalent in Welsh is coed. You find also the word doire in Scotland, which translates as a grove or thicket. In the borders another name for a wood, shaw, is used in place names like Henshaw and Shawburn. The roots of this word are Old Norse and originated with the Vikings who ruled parts of Scotland before the middle ages. Places were often named after a stand of trees, which says something about the land around them. A treeless area such as a mountain or a moor is likely to be identified by the only trees that were there. The Gaelic for oak is darach, and Creag Darroch, or ‘Crag of the oaks’ near Ballater is a hill that had a wood of oaks at the foot of it. 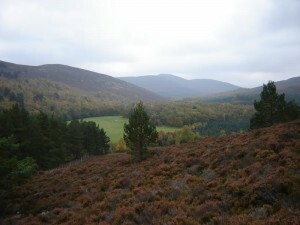 Likewise ghiuthas means fir or Scots pine, and Creag Ghiubhais meaning ‘Crag of the pines’, lies further up the same valley still flanked today by a forest of pine trees. The Gaelic word for willow is shellach or suil, and features in the place names Achnashellach and Glensuileag. These would originally be places in or beside willow woods where coppicing of willow was the main industry. Juniper was widespread in Scotland at one time and its Gaelic names, attin and samh, gave rise to places like Samhan near Mull and Attadale in Wester Ross. The aspen, whose leaves tremble and shimmer in the breeze was called critheann, from the Gaelic verb crith meaning to shiver. It was once considered a magical tree. An aspen leaf put under your tongue could apparently make you eloquent! Birch was known as beithe, so Coille Nan Beithe in the Cairngorms was once a birch wood. The alder tree was fearna, which appears in many place names such as the Hill of Fearn and the Fearn peninsular. The alder, which was prolific in the watery western regions, was also variously known as drumanach and droimlein. The Hazel they called Coll or calltainn, while Rowan was caorann or luis. All of these words in various spellings have been incorporated into place names so look out for them on your travels through Scotland. The fact that the Gaelic speaking people named so many places after their native trees proves what a deep connection they had with the forest. What a wonderful post. I feel closer to my Celtic roots after reading your fine words. Thank you for the work you do in Scotland. This is a wonderful sight. Thankyou for the work you do. I am Australian but come from British and Celtic roots. My roots often call to my imagination and the gaelic translations speak a lot to me.